PHILADELPHIA, PA - (@TheComedyNews) - After missing two key field goal kicks in a playoff loss to the Green Bay Packers, Philadelphia Eagles placekicker David Akers was forced by his team mates to dress up in a Scooby Doo costume and "wait for a special message from Michael Vick". It is believed that Eagles quarterback Michael Vick will be avenging the City of Brotherly Love's contempt for Akers' sub-par performance during Sunday's playoff loss. 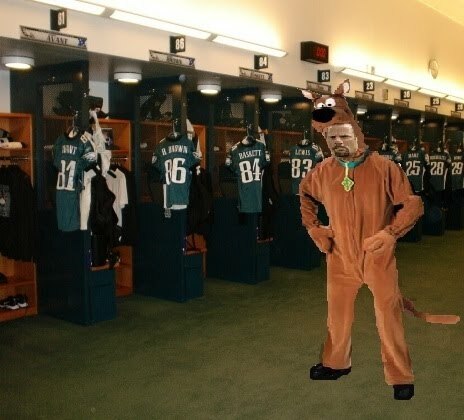 Akers was told to go to the team locker room, alone, and in a Scooby Doo costume. There, Akers will await the arrival Michael Vick with a 'special message'. "Oh this is not good, not good, nuh uh," trembled Akers while clutching the beige dog tail. "If there's anything Michael doesn't like, it's dogs and playoff defeat. And now I just wreak of both."